Note：This product includes sharp accessories, please stay away from children. Durable Nylon Case: Our tough case is high quality making it impact and tear resistant. Made from EVA material, with a zipper,easy to open and close. 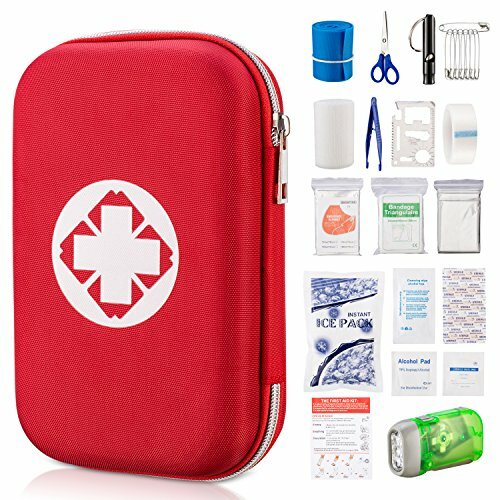 Variety of Tools: Well-Stocked 19 in 1 useful tools and accessories, including bandages, gauze pads, flashlight, scissors, emergency blanket and more. Lightweight And Compact: Only 0.97 lbs,and measuring 8.27 x5.12 x2.36" you can put it right into your pack-bag, car storage warehouse or suitcase. Multi-Purpose: Perfect for any occasion or events - family home, kitchen, workplace, schools, dorm room,pool lifeguards, church, but also includes tactical preparedness survival tools for outdoor wilderness adventure like camping, boy scouts, hiking, fishing, hunting, backpacking, sports, boats. Be prepared for disasters, like earthquakes, tornado, flooding, or hurricane relief. Customizable for your personal needs: Enough space to customize and add your own supplies for your unique lifestyle.